As I was answering some tests at Odesk — (which by the way you should check out if you are in need of extra cash.) 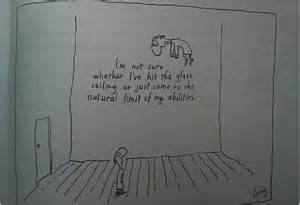 I stumbled upon the word Glass Ceiling — which in my case having a uterus, I think it’s preposterous. In a layman’s term, a ceiling is the overhead interior surface of a room. In another point of view, it is seen as a LIMIT. It implies that there is a limit to how far someone can climb it. The term is most often applied in business situations in which women feel, either accurately or not, that men are deeply entrenched in the upper echelons of power, and women, try as they might, find it nearly impossible to break through.